On January 31, 2017 in How To with 2 Comments. At the very core of building your log cabin, is the most important component of your build – trees. We have been using trees to build shelters and homes with since the beginning of time, and building with logs is still a very popular choice for many people’s homes. There is such a huge range of tree species to choose from, but did you know only roughly 2 dozen of them are used to build log homes with? So how do you know which trees to choose, how should you calculate how many trees you will need to build your log home, and how much will they cost? This article will address each of these questions, so by the end of it you will know exactly how many trees you need, an approximate cost and which species of trees you will use to build your log cabin. Which Logs for Cabin Building? We have already published a detailed guide on how to choose the best species of wood for your log cabin build, so this section will only touch on the most important aspects. Most importantly, if you’re buying logs from a reputable source rather than felling your own, you need to ensure that they are grade stamped to meet the most recent National ICC building codes. You should also, if possible opt from trees that were grown in a relatively high altitude, the slower the trees are grown, the tighter the growth rings are. This leads to dense wood which results in less cracking and checking as they dry. As mentioned above in the felling your logs sections, logs cut in the winter are the best as the sap levels are low. For a full breakdown of tree species and what to look for when buying logs, check out our article on how to select your logs. How Many Logs do you Need to Build a Log Home? In order to work out how many logs you need to build your log home, you need to know what your home will look like. Start by looking at log homes that you like, in your local area, on the internet and get an idea of what you want. Or you could use one of our cabin plans, which are ready to build. Planning is the most important stage of building your log cabin so make sure you get this stage right before rushing into the design. Once you know exactly what you want to achieve, you should sketch your proposed build and include size dimensions for height, width and depth. It doesn’t need to be anything fancy, just the basic shape with dimensions. Alternatively you may want to use an architect to have your plans drawn up which will give you a reliable and accurate figure for the number of logs you need. If you are building a cabin yourself, I recommend you make a simple square or rectangular shape to avoid lots of corners. Corners can be costly, more complex and add manual labor time onto your build. It’s important to remember that you don’t necessarily need full logs for a wall where there will be an opening, for example where you have a door. So, once you have your cabin designed and on paper, it’s just a case of applying a bit of basic math. Firstly, you’ll need to know the diameter of the logs you want to use. I recommend using an 8 inch diameter at the very minimum, anywhere up to 14 inches. A 10 – 12 inch diameter log is ideal. The way that you stack your logs will also have an effect on the number you will need, as will whether you intend to use them for internal walls. Remember to take all this into consideration. Let’s use a 20 x 24ft log cabin as a working example. Average log diameter = 10” (to work out your average log diameter, measure each end of the log and take an average of the two measurements. For example if the log is 11” at one end, and 9” at the other. 11”+9” = 20”. 20”/2 = 10”). Each log diameter is an average of 10”. Therefore, 10 x ? = 108. The number of logs you need for one wall is 11 (10.8 rounded up). You then need to multiply this by two as there are two 24ft walls. This gives you a total of 22 logs @ 24ft. Each log diameter is an average of 10”. Therefore, 10 x ? = 108. The number of logs you need for one wall is 11(10.8 rounded up). You then need to times this by two as there are two 20ft walls. This gives you a total of 22 logs @ 20ft. 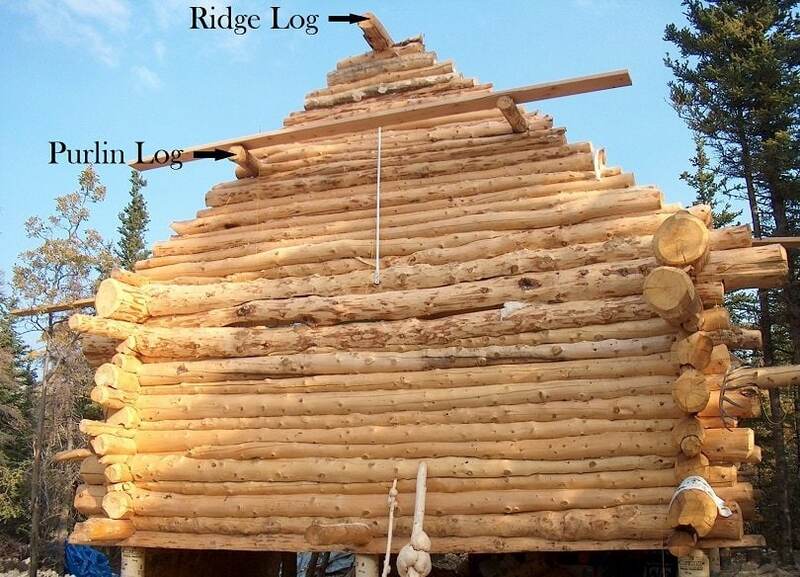 You’ll need ten logs for each gable if you stick with the same diameter. If you choose logs with a smaller diameter you can adjust accordingly. You will also need two purlin logs, and a ridge log. The purlin logs are the two logs half way up the gable wall, the ridge log is the top log. This equates to a total of 23 logs for the gable ends (2 gables @ 10 logs each plus 3 more). Now it’s time to add the four walls and two gable ends. 22 + 22 + 23 = 67 logs. Remember this doesn’t necessarily mean you need 67 trees! The average cedar tree is 50ft tall, meaning you could get two logs from one tree. Do you live on land that already has trees, or do you need to source them from elsewhere? Wide enough (8 inches at the very minimum in diameter). If you’re cutting your own trees, make sure you do it in the winter when sap levels are low. Read this article to find out how to fell trees safely, and how to prepare your logs. You might be able to source logs from other people’s land if they are willing to let you cut down some of their trees. This will completely depend on the area you live in (and how kind your neighbors are)! It is worth asking around, and putting adverts out in your local paper or shop window. Loggers normally work for sawmills so they don’t have a need to advertise their services. This means you might find it difficult to find one in your area without a bit of research. Contact the local sawmills, timber buyers and foresters to ask for the contact details of their loggers. Alternatively you can contact your states natural resources department or local farm agencies to point you in the right direction. Usually companies that offer tree services or removals, want to get rid of the logs they have collected so will gladly sell them to you and may even let you take them for nothing. You can find them advertised in local newspapers or the phone book. You should be careful when inspecting trees like this that they do not have any metal in them. If you want to buy your logs, buying from a sawmill is one of the cheaper options, especially if you buy green wood (recently cut wood) which has not yet been kiln dried, and air dry the wood yourself. Most people live within an hour of a sawmill so you shouldn’t have too much difficulty finding one. These companies can be a little harder to come by so unless you have one close by, I would suggest looking online at somewhere like Wood Planet. Companies use this website to list what materials they have available. It’s likely that if you’re reading this article, you want to build your own log cabin and not a kit build cabin. However, most Log Cabin Kit Companies offer a log & beam only package. This can include just logs, or logs that are precut to size. Your logs don’t have to cost an arm and a leg. There is a going joke in the trade ‘I built a free log home with a really expensive roof’. But how much should your logs cost you? This is always a difficult question to address because it depends on what area you live in as to what trees are readily available in your area. If certain species aren’t available in your area the cost will be higher because you’ll have to pay extra for transport. The cheapest way to source your logs is most definitely to fell your own trees. You can do this for next to nothing, just the cost of your tools and your time. The second cheapest option is to buy logs from your neighboring lands or tree service companies who often want to dispose of the trees they have logged. The next option is to buy your logs wholesale. Have a look at this site and this site for costs of different species. As an example if you buy an 18ft white pine log which is 10” in diameter, you can expect to pay around $25 per log. A sawmill is perhaps your best bet if you are looking for somewhere local to source you logs from. You’ll pay minimal costs for transport if they are close by (most people in America are within an hour of a sawmill) and if you opt for green logs they will be cheaper again. Alternatively, you can buy logs that have been kiln dried and precut to size from a sawmill, this obviously comes at a higher premium. It’s really difficult to give an accurate figure on the costs of buying from a saw mill as there are so many factors to take into account; region/availability/quality/how much you buy. Your best bet is to contact your local sawmills for a quote. The most expensive option of the log is to source your logs from a Kit Build company. Many log cabin kit companies will sell log packages as well, not just kit builds. Prices wildly vary for this so you should contact your local suppliers. So, you now know how many logs you need, where to source them from, what the cheapest and most expensive way to purchase your logs are, and the best species of logs to use. I hope we’ve managed to break this process down to make it manageable. If there is anything else you need help with, please do contact us. Which part of this article did you find most useful? Let us know in the comments below. I don’t know any suppliers in that area but I can leave the comment up to see if anyone else is able to help out.